It seems like Micromax will soon be announcing another smartphone dubbed as the Micromax Canvas Gold A300 this month, apart from the Canvas Entice A105. 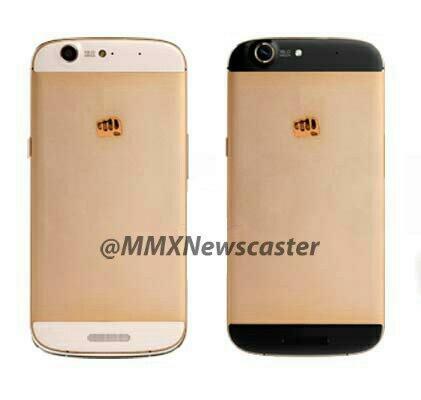 This will be the first Micromax smartphone to come in gold color at the back. Currently, we only know that there will be 2 color variants for this model namely White Gold and Black Gold as seen in the leaked image. The Canvas Gold A300 will also be another sleek device with a thickness of just 6.9mm – one of the thinnest smartphone in the market. Besides its unique colors, the Canvas Gold A300 also comes with a rather impressive spec sheet. According to rumors, the device will be powered by a 2GHz octa-core chipset with 2GB of RAM. Other key specifications include a 5.5-inch 1080p display, 16MP main camera, 8MP front camera, 32GB internal storage, as well as Android 4.4 KitKat running the show. We’re not sure how true this is, but reports have claimed that the Canvas Gold A300 will be announced during an official Micromax event on June 16.